Here is a list of project I find intresting! I must build this thing. This is a reminder to me. This project was created on 06/30/2018 and last updated 2 days ago. OpenTorque is an open-source implementation of the quasi-direct-drive actuation scheme pioneered by the MIT Biomimetics lab. The basic premise is this: use the largest possible motor with the smallest possible gear reduction. This results in an actuator that is robust, highly backdrivable, and capable of proprioceptive force sensing and open-loop impedance control. These are all ideal attributes for building legged robots. OpenTorque is being used in the Blackbird bipedal robot. Check that project page for links to the resources and inspirations I used when designing OpenTorque. STEP file of the assembly. STLs for the individual parts are available on the GitHub repo (https://github.com/G-Levine/OpenTorque-Actuator). The first OpenTorque v2 unit is built and working successfully, so I&apos;m releasing the design files. You can get them at https://github.com/G-Levine/OpenTorque-Actuator. They&apos;re licensed under Creative Commons BY-SA 4.0, so feel free to modify them and use them in your own projects. I&apos;m currently prioritizing passive cooling because my walking robot will have a low duty cycle on the motors. As a result, this version is releasing with passive cooling only. Active air-cooling will come in a future update. I&apos;d recommend it if you plan on building a robot arm, as the duty cycle on an arm is near 100%. Other future updates will include support for the single-axis ODrive board (once it&apos;s released). This will allow daisy-chained power and data connections between actuators, greatly simplifying the wiring. The two thin-section ball bearings are replaced by a single cross-roller bearing. Better cooling. The GPU fan is replaced by a powerful 100mm centrifugal blower. Higher gear ratio of 8:1, for higher peak torque and reduced I2R losses under normal loads. Custom PCB that breaks out the encoder SPI lines along with thermistor output and fan power to an RJ45 connector. This connects via a CAT7 patch cable to a custom daughterboard on the ODrive, pictured below. Lighter and more compact than the V1 actuator, and a closed back (no more exposed fan). Direct-drive version, in addition to the quasi-direct-drive version. These improvements are aimed at making it easier to build systems with large numbers of OpenTorque actuators. I&apos;m using the new actuator for my Blackbird Bipedal Robot but it&apos;s also well-suited for quadrupeds, robot arms, exoskeletons, and so forth. I tested the thermal performance at 30A, 60A, and 100A. This was done by setting the calibration current to the desired level, then disconnecting the encoder and having the motor search for the index pulse. This results in the heat being evenly distributed among the 3 phases, as described here: https://discourse.odriverobotics.com/t/testing-forced-air-cooling-with-a-5060-motor/483. I collected data from a thermistor epoxied into the motor windings, and the built-in thermistor on the ODrive board. The motor cooling works quite well. Three minutes of sustained 60A current caused a temperature rise of less than 20 degrees. The FETs on the ODrive board heat up quickly. Currently I&apos;m just cooling the board with a desk fan, so I&apos;ll have to design a more sophisticated cooling solution. I&apos;m building a bipedal robot inspired by Agility Robotics&apos; Cassie. It uses 10 OpenTorque actuators. These actuators are backdrivable and able to absorb kinetic energy during the walk cycle. As a result of this, there&apos;s no need for the complex series-elastic linkages present in Cassie. Instead, each leg consists of a simple parallelogram linkage with an extra joint at the ankle. To control this robot, I&apos;m going to use reinforcement learning. I&apos;ll create an OpenAI training environment with a simulation of the robot, then let the controller learn a stable walking gait on its own. This is a lot easier than programming a walking gait by hand, and it&apos;s already been done successfully on the Minitaur robot. Note: these instructions are for a previous version of OpenTorque. Go the the GitHub repo (https://github.com/G-Levine/OpenTorque-Actuator) for the latest instructions. Use 50% infill and a wall thickness of at least 1.2 mm. Nylon is the recommended material for the sun and planet gears. I used Taulman Alloy 910. Print the planet gears on rafts to ensure the first layer comes out perfectly flat. Otherwise you can run into issues with the gears meshing. All the parts are designed to print without supports. Place the inserts in the holes (marked in red) and set them in place with a soldering iron. Hi, what type of microcontroller do you use for controlling odrive, the MIT Cheetah is using nucleo boards with mbed RTOS, what is your suggestion? Currently I’m using a Raspberry Pi with the preempt-rt patch. I’m planning to move to a Jetson Xavier later. Hi Gabrael, for your force control you only use the current of the actuator or do you have some extra sensing ? Just the current. The gearbox is transparent enough that it doesn’t need any extra sensors for force control. Ok, what kind of motor is used. Or are you making your own with electromagnetic coils? Also, how does this attach/what part of it turns? I am thinking to maybe use this same concept slightly modified for a wheel drive on a vehicle. I am thinking you could put this inside of an individual wheel, and it would drive itself. It uses an off-the-shelf brushless motor intended for heavy-lift quadcopters. The mounting points are on the actuator housing. The output turns with the planet carrier. Hey Gabrael, thanks for the great project! Regarding your comment about using cross-roller bearing to make the gearbox more compact - are those simply thinner or will you also be changing the design in a significant way? could this possibly be thinned, so it is not as thick, and would fit better into exoskeletons? Yes, with steel gears. Hardened steel gears would be much thinner than plastic gears for the same load rating. They&apos;d be heavier and add about $100 to the cost of each actuator, but if you want maximum compactness it would make sense to use them. How thin could it get, from the back to a half inch shaft extending from it? 10 to 15mm thinner, depending on which gears you choose. The next version of the actuator will incorporate a cross-roller bearing, which will reduce the thickness by 10mm. This looks really awesome, this is exactly what i have wanted to do since i first saw Atrias and then Cassie. 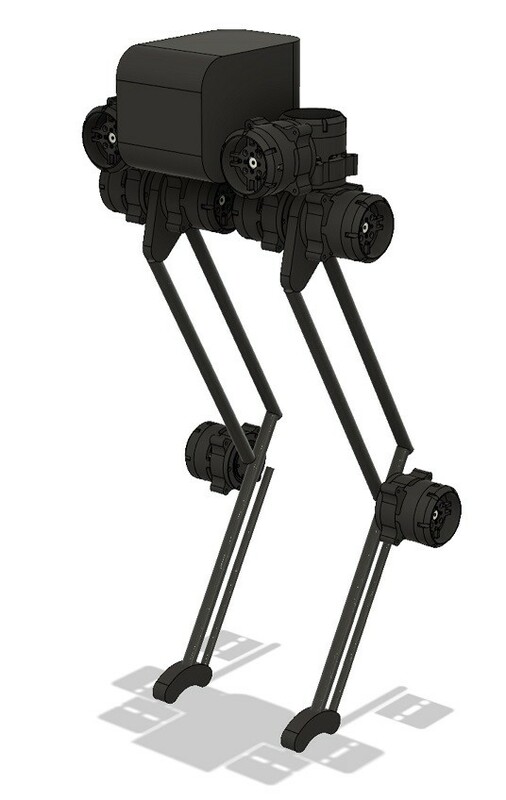 My only concern is the actuators on the knees, i know there is where the highest load are and it&apos;s very convenient to put the actuator directly on the joint. But this will have a BIG impact on the acceleration of the legs, more mass will have a big negative impact on how fast the legs can move from A to B. Have you tried to figure out a mechanical linkage to put the actuator for the knee at the hip level or at least as far from the feet as possible? To quote Colin Chapman, if you want more speed "Simplify, then add lightness”. The actuator on the knee isn’t for the knee, it’s connected to the ankle with a linkage. The torque requirements for the ankle are actually quite small (0 torque when the foot is on the ground), so it will be possible to use a much smaller motor there. The ankle actuator for the final design will either be a direct-drive 9235 motor (no gear reduction) or a 5008 motor with a 4:1 reduction. Ok, great! also, just noted that i made the comment in the wrong project, sorry. Now i see that its quite obvious that it is the ankle actuator that is placed on the knee. Very nice! I just order the motor so I can build one! :-) thanks for sharing! Hi Gabrael, your progress video seems really promising. I wanted to ask you, have you noticed any wear on the gears, or worsened backlash over time? I want to integrate your design into my robot arm project... I&apos;m still tossing up whether to use a cycloidal direct drive design, or the OpenTorque actuator with a belt drive to the joint. I haven&apos;t noticed any wear or increased backlash on the gears. Just make sure to use nylon and not ABS. this looks to have real potential, cant wait to see how it develops! Open Source competition robot development. You will never be alone for your contest again! TITAN is a large 6WD chassis designed for big robotic projects. You are about to report the project "OpenTorque Actuator", please tell us the reason.